Eden Strader Workshop, Pt. 2: you guys. I never, in a million years, thought I'd be a fan of studio bridal sessions. But I am. 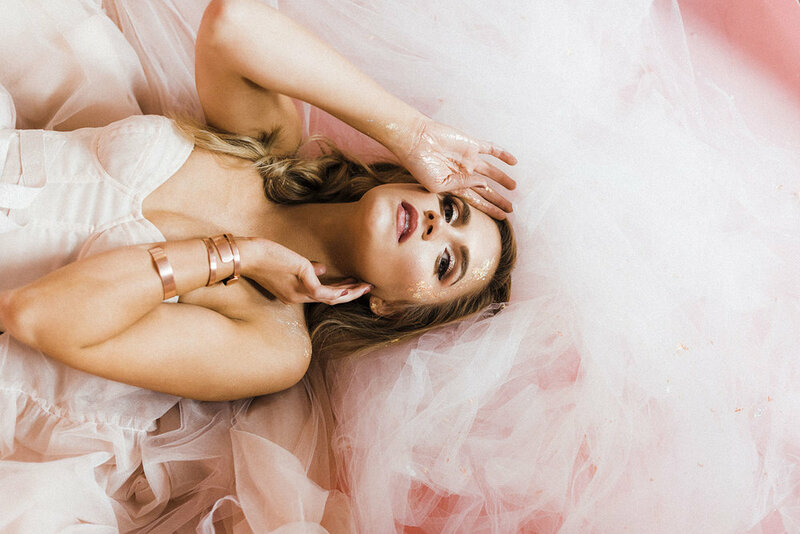 Eden put together this bridal session with nothing more than some pink paper as a backdrop. No epic views, no stunning bouquets. Just Alexa, a gorgeous haute couture wedding dress by Jean and Jewel, and some tulle and pink paper. And it was so much fun. I'll always love the adventurous sessions that require boots and some trekking, but friends, there is something totally unique about capturing a bride with nothing else on which to rely. This opportunity forced me to think hard about creating visual interest without relying on the normal crutches. It forced me to think about her facial features: what did I want to draw attention to? The dress: how could I emphasize the way the layers move when there was no wind to catch the layers? And, perhaps most challengingly, how to get it all done in 5 minutes. That's right. We had no idea what to expect with these shoots: no idea about the location, type of session, props, lighting conditions - nothing. Then we were given 5 minutes each to direct Alexa and get our shots. Holy Hannah, guys. The student in me LOVED this challenge and now I'm mildly obsessed with studio bridal sessions. So! Are you thinking about a bridal session, but not sure you want to dirty your dress before your big day? Let's do a studio session! Scroll on through for a few favorites from this session! Guys, I spent last weekend in Salt Lake City learning from one of my favorite 'togs, Eden Strader. Before I tell you why the workshop was awesome, I feel compelled to tell you why Eden's work is awesome: I found her a year or so ago on IG and immediately noticed her work because it stood out so much in a sea of bridal and wedding photography that, while beautiful, looked very similar. Eden's work stood out to me because she embraced that harsh, midday light that so many avoid and just rocked it. Looking at her feed as a whole, I also loved the fact that, while her work is consistent in her ability and certain elements that she incorporates in all of her work (color! ), there was so much variety in where and what she was shooting! It didn't feel like I was looking at a single wedding album: there were high fashion bridal shots in studios with bright backgrounds, super creative double exposures, some carefree outdoor portraits, and so much more. It made me feel infinitely better about the fact that my IG doesn't look like it's made up of a single wedding or occasion (nothing wrong with this approach - I actually HATED that I couldn't master it!). So! Her work spoke to me because it was different from everything else I was seeing, but still so beautifully done. When Eden announced that she was hosting a workshop, I jumped at the opportunity to learn from her. And guys, this totally pushed me creatively. I've spent some time this winter expanding my studio work (because who wants to stay outside when its -127 degrees and blizzarding - not me), but I definitely wanted the chance to learn from someone who does it so. Damn. Well. As part of the workshop, Eden set up two different shoots: one couples' portrait session (this post) and one editorial bridal session (I'll share this one shortly). If you know me at all, you know I LOVE candid, natural interaction. True posing is way outside my wheelhouse and I didn't think I wanted any part of it, but I really loved the challenge of drawing out certain emotions with nothing to rely on, other than the couple themselves. No background, no space to tell them to run off into the sunset. Just two (okay, admittedly beautiful) people and a blank wall behind them. And I really love the way the shots turned out. So friends, editorial/studio work may not be everyone's cup of tea, but I hope that you'll consider it when planning your engagement photos or simply for your next portrait session. It's completely different from so much of what's out there right now and I think it can produce some really beautiful results. Scroll on for some highlights!